VIRAL: 2 YEARS OLD NA BATANG BABAE, PWINERSANG IPAKASAL SA 65 YEARS OLD NA LALAKI! What would you do if you saw a wedding party between a 65 years old groom and a 12 years old bride? Sometimes in order to understand the reality of an awful global issue, people need to be able to see it happening right in front of them. 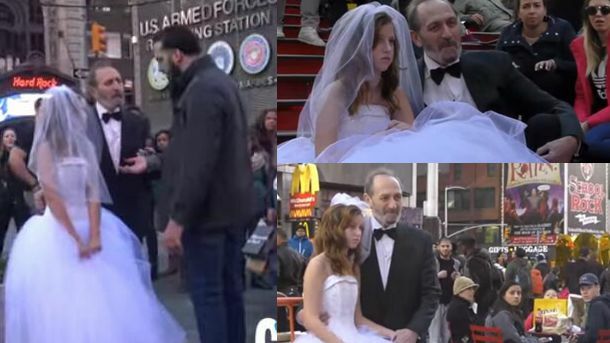 So in order to raise awareness about the global issue of arranged child marriages, Coby Persin, 21-year-old YouTube star, decided to push the envelope by asking a 12-year-old 'bride' to pose with a 65-year-old 'groom' in the middle of Times Square - despite the fact that child marriages aren't actually legal in the United Status. 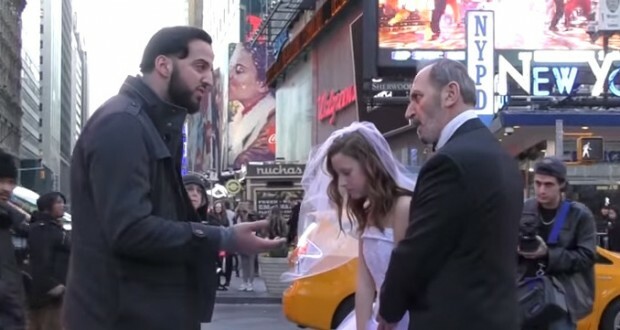 In his latest social experiment clip, Coby brings the man and his young 'wife' into the middle of Times Square for a staged post-wedding photo shoot - sending passersby into a fit of anger.